Last week, in our editorial, TNR asked: “How should liberals feel about Occupy Wall Street?” The magazine took a skeptical view of the protests; a number of our writers (John B. Judis, Jonathan Cohn, and Timothy Noah) have taken a more positive stance. Over the next week, we’ll be publishing a symposium at TNR Online in which a number of prominent liberal thinkers offer their answers to this question. Paul Berman on why he supports Occupy Wall Street. Will Marshall on how Occupy Wall Street will hurt liberals. Todd Gitlin on how the protests are chaotic, romantic, and utopian. William Galston on how Democrats can make common cause with Occupy Wall Street. David Greenberg on why liberals need Occupy Wall Street, and vice-versa. Fred Siegel on Occupy Wall Street and the return of the McGovernites. Michael Kazin on how the protests offer a promising new model for the left. 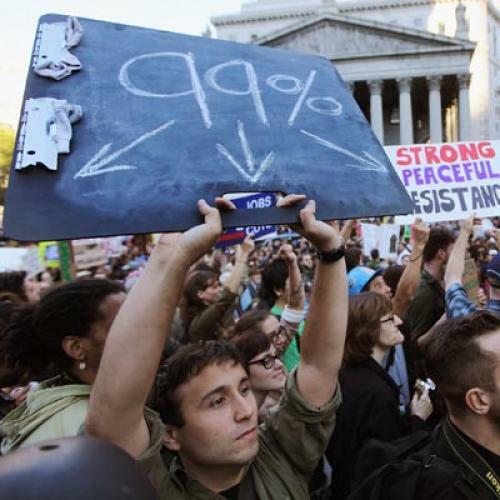 Ruy Teixeira on why a majority of Americans are getting behind Occupy Wall Street. Franklin Foer on how Democrats are misreading the symbiotic relationship between liberals and the left. Matt Yglesias on how Occupy Wall Street is a rational response to a system that's failed.